Baan Rim Taan is located high on the hills in Maenam, overlooking the coconut canopy, out to sea and over to Koh Phangan island. This villa has everything you could want designer kitchen with built-in SMEG equipment including a dishwasher, oven, hob etc. Open-plan lounge and dining area (indoor seating for 6) with sliding doors onto the sea view terrace and pool. Upstairs to the second sun terrace with dining table (for 6) and 2 sunbeds. Guest bedroom with en-suite shower room and the sensational master bedroom with en-suite air-jet bath and separate shower cubicle. Italian marble surfaces, over-sized mirrors. The villa water is supplied from your very own waterfall and undergoes three system filtration to ensure pure water. throughout. The tiled pool is 8m x 4m with infinity edges on two sides. 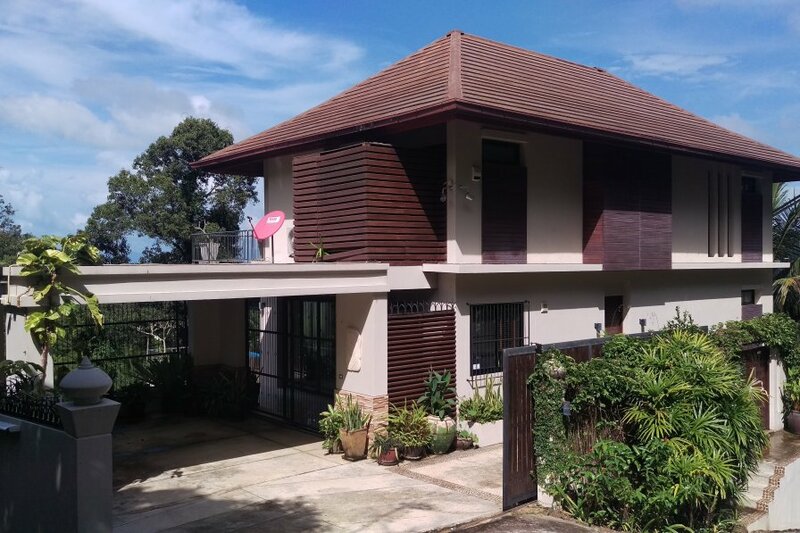 This magnificent home is fully air-conditioned throughout with internet and satellite TV connection, plasma TV with surround sound and DVD player (MP3 compatible). There is also a 42 inch plasma TV with DVD player and satellite connection in the master bedroom. The property is walled for privacy. The remote controlled gate affords access to the car port. Feature pond and gardens with a pathway down to the stream at the bottom of the garden. If you are looking for a very private, very peaceful holiday base, look no further.